Home construction change orders occur when home buyers or homeowners decide to make last minute changes, or after the fact changes, to their home construction plans. Home construction change orders can add significant cost overruns to a new home construction project as well as set the project back by days, weeks and possibly even months. At all costs home construction changes should be avoided as they bring only pain and heartache to all parties; the general contractor, the subcontractors, and most importantly you. The best way to avoid making home construction change orders is to have a complete set of house plans and specifications that you have thoroughly read, understand and agree with in 100% entirety. This means you understand and agree with every aspect of the plan, including where each light fixture and outlet are going, the color of interior and exterior paints, the selection of appliances and bathroom plumbing fixtures, etc. It is important to fully appreciate the magnitude of a new home construction project and the costs associated with a home construction change order, whether it is for the building of a new home, a home addition, or simply a bathroom remodeling project. There are many decisions that have to be made in anyone of these projects and all of them should be made prior to the actual start of construction. If you hold off and make these decisions until the last minute, or after the work have already occurred, you will end up with large cost overruns, schedule delays and very upset contractors. A typical scenario of a home construction change order is the changing of an electrical outlet location. The home buyer happens to be walking through the home construction project after the drywall is up and in the process of the walk-through notices and outlet location that they don’t like. So they talk to the general contractor and request that it be relocated and they say they are willing to pay for this “simple” home construction change order. What the home buyer doesn’t realize is that the general contractor now has to bring the electrical subcontractor back in to move the outlet, and the drywall subcontractor to patch up the hole from the old outlet location. Thus the cost of making this “simple” electrical outlet location involves the general contractor and two subcontractors. Suffice it to say, the cost of this “simple” home construction change order is not cheap. 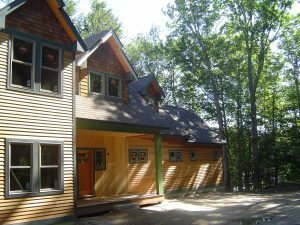 So again, the key to avoiding costly home construction change orders is to fully understand every aspect, feature, and building material specified in the house plans and specifications. One way to help you do this is by visiting your local home supply store, and selecting and documenting the specific building material items you want to use in your home construction project. This includes items such as doors and windows, siding, masonry, paint colors, appliances, lighting fixtures, bathroom fixtures, cabinets, and even shrubs if your home construction project requires landscaping. Every finished building material you care about in your home construction project should be decided upon before home construction begins. To conclude, general contractors and subcontractors hate home construction change orders, and you will too when you see their associated costs. For the most part the costs are real, but you do set yourself up for price gouging. However, it is important to understand that the contractors’ have busy schedules and home construction change orders are disruptive to them. They have their own business schedules to maintain, and when they spend an extra unplanned day or week on your project they end up having to hold off other customers, and run the risk of losing them. So avoid home construction change orders at all costs. You’ll save yourself time, money and a lot of aggravation on every ones part.